What if a single revelation, like a single choice, changed everything? The faction based society that Tris Prior once believed in is shattered, fractured by violence and power struggles and scarred by loss and betrayal. So when offered a chance to explore the world past the limits she’s known, Tris is ready. Perhaps beyond the fence, she and Tobias will find a simple new life together, free from complicated lies, tangled loyalties, and painful memories. But Tris’s new reality is even more alarming than the one she left behind. Old discoveries are quickly rendered meaningless. Explosive new truths change the hearts of those she loves. And once again, Tris must battle to comprehend the complexities of human nature, and of herself, while facing impossible choices about courage, allegiance, sacrifice, and love. My name is Edith Prior, and there is much I am happy to forget. In an attempt to reveal the video of her ancestor, Tris is now free of the fractions that oppressed society, that her Divergent status holds more power that she could have ever imagined. Tris, Christina and Cara are now sharing a cell at Erudite headquarters, the weight of being back holds the memories that haunt Tris, the walk to her execution, her brother Caleb's betrayal and the truth serum. Evelyn Johnson, Tobias' mother now oversees the trials, where Tris is being held prisoner. Evelyn has the city under control, with armed factionless patrolling the streets, and since the death of Jeanine Mathews, there is no one to challenge her rule. When the whispers of rebels organising, calling themselves the Allegiant. They want to leave the city, believing that society should carry the factions forward. Where the choosing ceremony allowed those to choose which faction to join, Evelyn hasn't liberated the community, she's left them all factionless in a city plagued by fear. As expected, the rioting begins for those wanting to destroy all traces of the faction society, against those who still believe in preserving aspects from their former way of life... And Evelyn doesn't seem surprised by the increasing angst and demonstrations. This isn't what Tris fought for, so when the opportunity arises to discover what is outside, it's time for the group to rally. Tobias is out of his element, gone are the days of Four, the name provided by his Dauntless faction. He can't live under Evelyn, his mother every piece of the tyrant her predecessor Jeanine was. 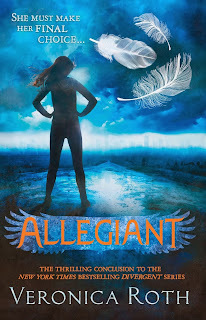 The Allegiant rebellion have offered the chance to leave, and Tobias hesitantly agrees to join Tris, Christina, Cara, Tori, Uriah and Peter will join the Allegiant leaders, along with a reluctant prisoner that has spent his life determined not to venture beyond the fence. But what the group find is a modern civilisation, walking into what is known as the Bureau Of Genetic Welfare, located in a compound formally known as an airport and is an agency of the government of the United States. Living within the stifling oppression of the factions, couldn't have prepared them for the magnitude of the world that they have been absent from for so long. Seeing and hearing things that they may never comprehend. But it seems the Bureau already knows who Tris is, and very much a part of the society beyond their fences. The new society are based on the science of genetic testing, that the government manipulated the genes of citizens who were determined to have a disposition, towards cowardice, dishonesty, low intelligence, the ultimately led to a broken society. The Purity War was forged against genetically healed citizens, the only ones that held positions of power and influence or those known as the Divergent, the ones society deems whole and pure... Anyone else is simply damaged. But not everyone within the Bureau shares the same opinion, that people are simply responsible for their own actions, something that science may never any reasoning from, but it's easier to blame genetic disposition. When Tobias befriends one of the internal rebels working against the bureau, he is recruited to join their cause, driven by his own personal demons. The Fringe is nothing as Tobias expected, and has him longing to return back to the comfortable city living he's become accustomed to, but here, they know the truth. What the bureau stands for, what they've accomplished so far and before they can take further steps, The Fringe uprising plans to stop them from reinstalling the same pattern of cruelty and dictatorship. But how far are they willing to go? Their plan is to steal life altering serum to destroy, but Tris is right to be suspicious, with those who have a consuming hate against what the Bureau stands for, all they plan on committing is breaking and entering? It's a pity Tobias can't see through their plan. They want an explosion of anarchy and to destroy those who have destroyed before them, and now responsible for the deaths of hundreds of citizens... And countless lives will be destroyed. But with any rebellion, comes sacrifice, something Tris and Tobias understand first hand from their simple Abnegation past. Friends will fail, some will fall, but how far can a minority group take their fight, even if it's for the greater good. Let me start by saying, that before Allegiant was released, I already knew what to expect after seeing a review on Goodreads. If that wasn't bad enough, everyone in Australia seemed to have their copy before I did, and had to chase up my order through the online bookstore days after it's release. Then, the delivery was delayed, so you can imagine I may have been a tad annoyed before I even cracked the spine. But I loved Divergent and Insurgent passionately, so I thought that it would have been well worth the wait, and it was... In a way. Where books one and two in the series were all about a revolution against an oppressive regime, overturning a tyrant and overcoming prejudice to unite, Allegiant as though it was an intellectual science fiction, with an action scene thrown in now and again. I did enjoy the genealogy aspect, but it overtook the storyline and I found myself wanting to skim over passages as I felt they were too repetitive. Between the Allegiant on The Fringe and those in the Bureau, it felt a little too confusing, but I really enjoyed the addition of the new characters, especially Mathew and wished that he has played a bigger part. I think the biggest difference is in Tobias. He has shed his Four persona, and readers will finally get to see the scared, unconfident and lonely boy that he ultimately is. But be warned, he's quite temperamental in Allegiant, and seemingly spends most of his time complaining or attending his own pity party. The ending is what most fans of the series will be interested in, and I thought it was fitting. Even with Allegiant being somewhat of a disappointment for many, Veronica Roth should be applauded. She's created a brilliant series, regardless of the ending, that fans have enjoyed and will talk about in years to come. I wanted to love Allegiant, but it just felt too incomplete compared to what I had expected.